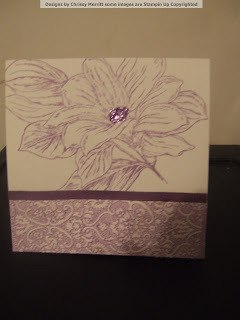 On my SisterHood of the Blogging Stampers this months challenge is to make a mothers day card, anything goes. I love the From the Garden flower from SU (contact me to find out how you can get this stamp for free). Normally I like to color in my images but this wasn't is pretty plain. I was surprised at the size of it. 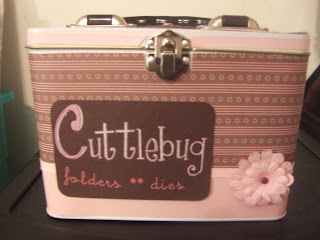 I'm hooked on inking the cuttlebug folder, I love it. I did that technique again on this card using the Textile embossing folder. 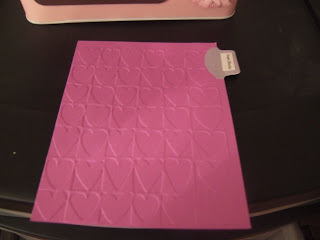 Now that my embossing folders are organized (click to see how I organized them) I will be using them more. I stickled the center of the flower. Happy Sunday! It has been another fun packed week, well I wouldn't really call it fun. Our whole water system failed us all at once. Everything that has to do with our water died all at one time on the same day. Thankfully my Uncle knew an electrian and we were able to get a steal on his labor cost. Now on to a happier note its Sunday Scrappin Time!!! Sunday Scrappin is a wonderful group of people who give you the support you need to get those weekly Ta Da's (goals) done. It's great because there is no punishment if you are unable to meet your goals for the week. If you get a chance stop over to Sunday Scrappin we would love to have you join us. This week's Bonus question is What inspires you to sit down and craft? 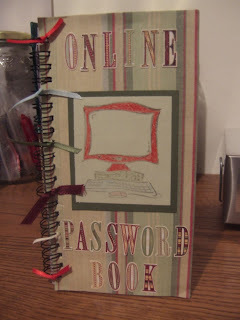 Throughout the course of the week when card ideas or scrapbook pages come to me I write them down in a notebook and this way when the weekend comes (when I have more time) I can sit down and play and don't have to sit there trying to come up with an idea. 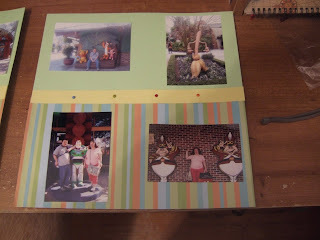 I have found now that my supplies are more organized (and still got a ways to go) I make more cards and pages now. For Easter Jeff got me the Pooh & Friends Cricut Cartridge. My sister Kay loves the Heffalumps. She was thrilled when I told her there was a heffalump on the cartridge. I decided to make her a card. Over the next several weeks I will be putting together a list (as I go along) of the corresponding SU colors that match the disney characters on the cricut cartridges. I have another card idea using this cutie. I wanted to check in and let everyone know I'm still around. Its been a quiet but busy week. I will be working on Easter cards and projects until the very last minute. I am so out of whack with Easter being early this year and the weather doesn't feel like Spring. Its just been a crazy week. On Sunday I will have my Easter projects to show (I have nosey people who check in just to get a sneak peak LOL). I hope everyone had a great week and have a blessed Easter. I've been tagged by Dawn These tags are a great way to get to know each other. 1. I am a banker by profession but I can not save a penny if my life depended on it. I believe in spending every penny me and my husband earn. But I can give you great tips on how to save. 2. I would love to travel to Italy one day but if had the choice between DisneyWorld or Italy I'll probably settle on Disney. 3. I have a lead foot. I have a hard time doing the speed limit. I blame my parents because my dad waiting until the last minute for me to get my license because it ment his little girl was growing up and being I would have to travel the thru way (speed limit 65) I learned to drive on the thru way. So 65 and faster is my speed limit (local town speedlimit 30 highway 55). But I'm a safe driver. 4. I do not know how to swim. My mother was teaching me and I was standing on a rock that was only up to my ankles and I turned around and I slipped off the rock and went in over my head. My mother who is an amazing swimmer saved me from almost drown and she went back down under the water as far she could go (which was deep) and she couldn't find a bottom. My mom lost 2 brothers from drowning so after that we didn't go swimming. 5. I hope to be one day blessed with a child. NO this will not replace our son Dylan who passed way to SIDS. But I believe my husband and I would be amazing parents and deserve a child! 6. We treat our dog Buddy like he was a human. He eats human food, sleeps on the bed with us (hey maybe that's why no children for us - LOL), he goes in the car with us. He is spoiled and knows it. 7. I can't wait for spring and summer for the sun to shine and so that we can take Buddy outside to play frissbee and catch. Can't wait to take Buddy to the park for walks and in the creek for a swim (its not deep so I don't mind). Can't wait to just be outside!! I made this strawberry shortcake page for a friend, I hope she likes it. I covered the little girl's face and name for privacy reasons. It reminds me of when I was a little girl I dressed up as strawberry shortcake for halloween (I had a different costume) and I won first place at the VFW. I should pull the picture of me out and make a page. LOL! At first I was going to use pink and red colored cardstock but then I came across this pattern paper in Michaels that was a must have. 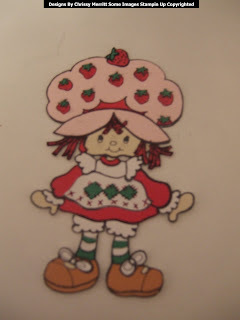 The Strawberry Shortcake title and Strawberry Shortcake in the Left hand corner are paper piecings. I was looking for Strawberry shortcake embellishments with no luck when I came across a coloring book in the dollar store. 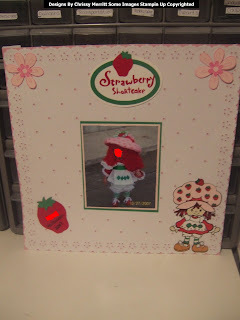 The strawberry on the title and right hand side of the page is from Animal Kingdom Cricut Cartridge I cut out the cows head cut off the ears and flipped it over so the features didn't show and drew seeds on it (this wasn't my original idea but I'm sorry I don't recall whose idea it was). The flowers in the corner are flowers are stamped on pink cardstock in Pixie Pink Stampin Up Ink and the flower is from the Stampin Up Friendship Blooms stamp set that was offered during Sale A Bration promotion. Today I receive an email from Beth at Insporational Blog asking if it would be okay if they featured my Mr. & Mrs. Peter Rabbit cards on their Blog!!!! Of course I re-read the message a zillion times and then I doubled check to make sure it was addressed to me and sure enough it was true! Go check out Inspirational blog. It's a blog that features various artisit!!!! I am so excited!!! Be sure to check out the page my cards are on there!!!!!! I am so excited!!! It's the start of a new week and another Sunday Scrappin Post! I love Sunday Scrappin. It's a great group of people who share their Ta Da's (week's goals they completed) and their Ta Do's (goals they want to complete in the coming week). Can you believe I am sick again?? I have never been sick like this or as much as I have been this winter. This past week I didn't get much done. I still can't share my strawberry shortcake layout with you from last week, my friend had a family emergency in the city and I haven't been able to get the page to her. 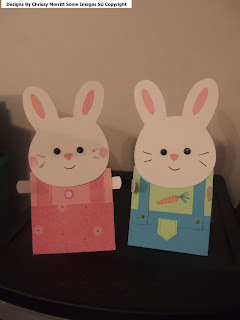 I do have one Ta Da to share yesterday I suffered through and made easter cards and I placed my first Stampin Up order this past week as a Demo. I can't wait to get my new goodies and I better be feeling better by then. I want to make my new little friend Hunter a candy holder in the shape of a carrot. This week's bonus question is How long could you keep on crafting without buying new supplies? Oh my! LOL! My husband would say I don't understand why she will ever have to buy another thing again she has so much, she can stock a store. OOkkk I must admit I do have a lot but there is always something that I must have, not saying a necessity but a must have. LOL! If I was to just use my stash I probably could go a good year ok probably more but I would need adhesive I go through it way to fast. And now that I'm a Stampin Up Demo and just recently bought paper in all the color families I should really be set. As I look around the room and I see a 2 paper racks full and another pile of paper waiting for another paper rack to be bought I think I would be set for a long time. 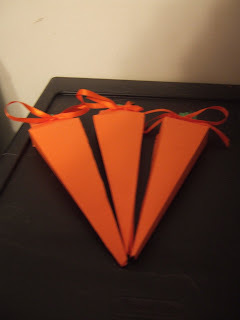 I haven't done much this week craft wise, I am sick again with another cold. What a winter it has been, can't wait for it to be over with. To add to that I am all out of whack with Easter being early this year. Can't believe a week from tomorrow is Easter. I finally started my cards today, yes that's correct today. I don't have many Easter stamps and the one's I do have I have used on cards in the past and couldn't think of new ideas for them (foggy brain due to the cold). I love the bunny head on the cricut doodlecharms cart so that's what I used. I think on the next set I do I am going to do the boy bunnies nose in brown or black to make him more boyish. Bunny Head - Head is from Cricut doodlecharms cart, the pink ear part is regular pink cardstock the shape is from Cricut George Cart. Eyes are black eyelets. The face is colored in with SU Black Stampin Write Marker, Nose is colored in with SU Pretty in Pink Stampin Write Marker, and the checks are colored in with SU Stampin Pastels. Mr. Bunny's Clothes: Shirt is SU Green Galore Cardstock. Suspenders are rectangles cut from Cricut George Cartridge. 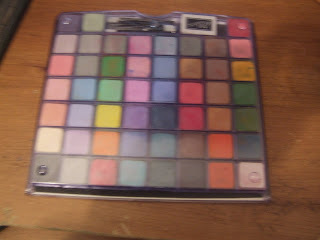 The brads for the supender buttons are non SU brads and the pants and suspenders are SU Tempting Turquoise Cardstock. The carrot on the shirt is clipart from the internet that I cut out on cardstock. The pocket I handcut and is Green Galore Cardstock. Its hard to tell in the picture but I drew lines on the pants to look like sewing with the SU Green Galore Stampin Writer marker. The arms are cut from the George Cartridge using the cylinder shape. the flower on her shirt is stamped with SU Pixie Pink Ink and the flower is from the Friendship Blooms Stamp Set from Sale A Bration. My friend Hunter (age 6) made me a card. He is the cutest little boy ever! I just recently meet his mom she recently moved here . They moved to NY at the coldest wettest time but they are slowly adjusting. 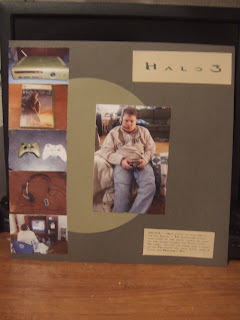 The card he made is adorable, I love these types of things. 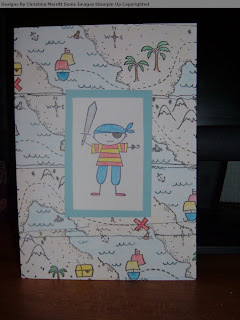 I made this card awhile back for a little boy that was celebrating his birthday. 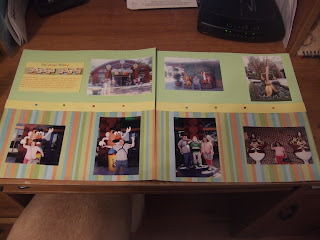 Everything on the card with the exception of the coloring and cardstock are Stampin Up (SU). Stamps used Ahoy Matey and Matey's Map Wheel Stamp. This is an adorable boy stamp set. This day is flying by me today. Did everyone remember to set those clocks ahead. I love the idea Spring is on its way and more day light but I don't like losing that hour sleep, it throws me off for a few days. It is Sunday Scrappin time! Its time to share our Ta Da's (goals completed) and our Ta Do'S (goals for the upcoming week). If you have a chance check out the group, it's a wonderful supportive group! This weeks Bonus question is What's on your craft supply wishlist right now? Please tell us what you'd like to have and why. Links or photos would be great, too! I found a sketch on SCS my original intention was to follow the sketch to a tee before I realized it I changed it a little but I'm pleased with the end result. 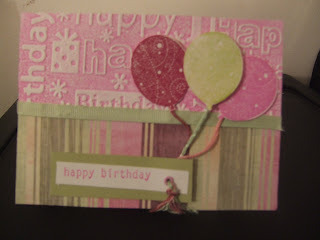 All products used on this card are Stampin Up. The stamp image is the bird from Fun & Fast Notes Stamp set. Under the bird is a saying that says Thanks...I needed that. But sometimes I stamp the image and only want the image not the saying that goes with it, so I cut the saying out separately and mounted it to the side of the block, so its like 2 stamps in one. 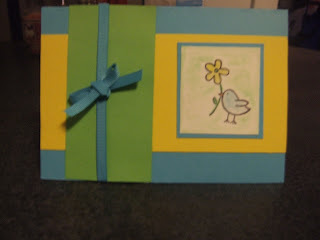 It may be hard to see but around the birdie I chalked and then used a blender pen used Green Galore Stampin Pastels to match the green strip. 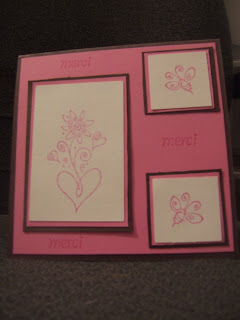 Tonight I played with the Stampin Up Merci Stamp set. For each $50 order you place before March 17th you cand get a free stamp set out of the Sale-A-Bration catalog, and this stamp set is part of that promotion. If your interested please contact me ASAP before time runs out. 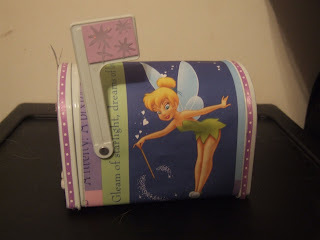 I was visiting Elizabeth's blog tonight when I saw she had a post about Sheetload's Blog besure to check out their blog they are running a bunch of great contest. A lot of fun stuff going on over there! 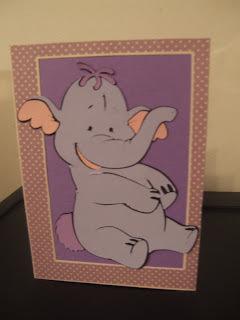 As promised, I played with my new Stampin Up (Demo) kit today. I was feeling grouchy and was having a horrible day at work and I really wasn't in the mood to "play" tonight and then the more the box sat there open the more I had to dive in and play. I also have a funny story to post after this post about my demo kit so be sure to check back for that, you all will get a kick out it (it is craft related). PS. 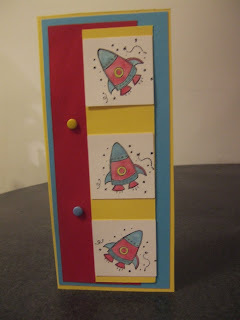 You'll see alot more of this rocket ship because I have plenty more card ideas for it! I love it! 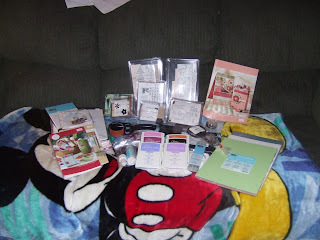 I am so excited my Stampin Up (SU) Demo Kit arrived today. It felt like forever before it was ever going to make it to me. I had a horrible day at work so I am hoping to go unwind and make something fun and cheery with my new kit. And no the mickey mouse blankie wasn't part of the kit --- that's Buddy's (my dog) other blankie for when he's on the couch. He wasn't to thrilled with me when I put my stuff on it to take a picture. LOL! There is an awsome deal going on until March 17 with the Demo Kits. The price can not be beat. If your interested in more information or becoming a demo send me an email. You can sign up as a Hobbyist also. Good morning! It is Sunday Scrappin Time where I post my Ta Da's (goals I accomplished this week) and my Ta Do's (goals I want accomplish this week). Its a great group over there, very friendly and supportive! Go Check it out, of course after you read my post. 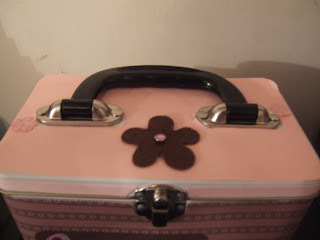 Play with my Stampin Up Kit that is suppose to be here Tuesday! This weeks bonus question is: Do you usually do your crafts alone or with friends? Which do you prefer? I occasionally scrap with my younger sister Kayla and I love it. 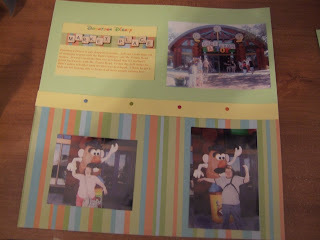 She is 12 and just getting into the whole scrapbooking/cardmaking thing. I love when she over and I can say hey how does this look instead of asking Jeff who I sometimes feels tells me what I want to hear so that I don't slap him. LOL! 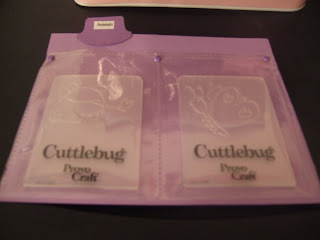 I love the disney cuttlebug embossing dies/folders. 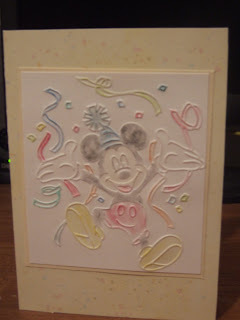 For this card I used the Mickey Celebrates embossing folder. I was so excited that my AcMoore had these in stock so I didn't have to order them online and wait for them to come, I hate waiting I'm so inpatient. 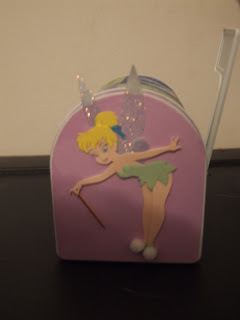 But I still need to order a few more of the disney ones online but not many so its okay to wait for those. LOL! 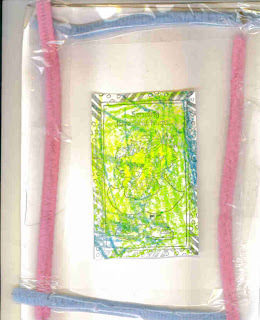 I colored the embossed image in with a Q-tip and chalk (hey it works) , I can't wait for my Stampin Up Demo Kit to arrive so I can play with my Pastels and Blender pen --- Fun Fun Fun!! !